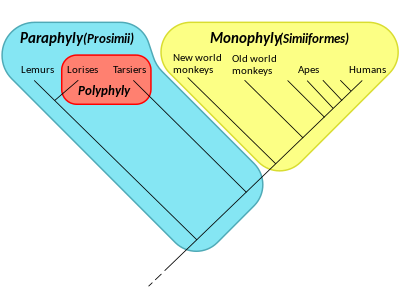 Among animals, several familiar groups are not, in fact, clades. The order Artiodactyla (even-toed ungulates) is paraphyletic because it excludes Cetaceans (whales, dolphins, etc.). In the ICZN Code, the two taxa are orders of equal rank. Molecular studies, however, have shown that the Cetacea descend from artiodactyl ancestors, although the precise phylogeny within the order remains uncertain. Without the Cetacean descendants the Artiodactyls must be paraphyletic. The class Reptilia as traditionally defined is paraphyletic because it excludes birds (class Aves) and mammals. In the ICZN Code, the three taxa are classes of equal rank. However, mammals hail from the synapsids (which were once described as "mammal-like reptiles") and birds are descended from the dinosaurs (a group of Diapsida), both of which are reptiles. Alternatively, reptiles are paraphyletic because they gave rise to (only) birds. Birds and reptiles together make Sauropsids. Osteichthyes, bony fish, are paraphyletic when they include only Actinopterygii (ray-finned fish) and Sarcopterygii (lungfish, etc. ), excluding tetrapods; more recently, Osteichthyes is treated as a clade, including the tetrapods. The wasps are paraphyletic, consisting of the narrow-waisted Apocrita without the ants and bees. 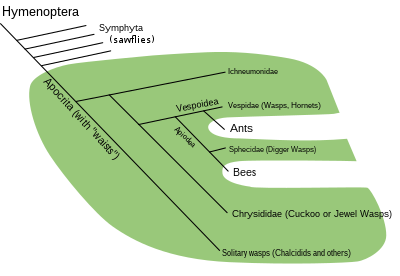 The sawflies (Symphyta) are similarly paraphyletic, forming all of the Hymenoptera except for the Apocrita, a clade deep within the sawfly tree. Crustaceans are not a clade because the Hexapoda (insects) are excluded. The modern clade that spans all of them is the Tetraconata. ^ Johnson, Brian R.; Borowiec, Marek L.; Chiu, Joanna C.; Lee, Ernest K.; Atallah, Joel; Ward, Philip S. (2013). "Phylogenomics Resolves Evolutionary Relationships among Ants, Bees, and Wasps" (PDF). Current Biology. 23 (20): 2058–2062. doi:10.1016/j.cub.2013.08.050. PMID 24094856.